How do you improve on a classic performance keyboard like the original Electro? You could take it gently, or you just do what we did with the Electro 3; push it as far as you can, and then a bit further. The demands from a performing keyboard player haven't really changed all that much, good quality never goes out of style. We just want to offer you some of the best stuff we have, in a affordable and easy-to-use instrument. We hope that you will have as much fun owning and using the Electro 3, as we have had developing it. 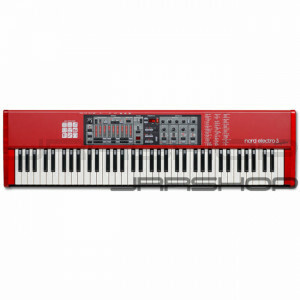 The Nord Electro 3 is compatible with the new Nord Piano library. It takes full advantage of the Library's multitude of velocity layers, pedal-down samples and extremely high quality samples providing you with an unprecedented expressiveness. Any current or future piano that is available for the Stage family will also automatically be available to the Nord Electro 3. Right from the start, the Electro 3 is loaded with a great selection of pianos. There are three acoustic grands (two Yamaha* C7s and one Steinway* D) and two electric grands. Electric piano aficionados will love the tine-based types; a Mk I, a Suitcase Mk I, a Mk II and a Mk V all with their unique and distinctive personalities. A great Wurlitzer* A200 is of course present, as is the mighty Clavinet* D6. The Clavinet type also includes the Harpsichords. There is a French harpsichord in the factory sound bank, and more to come in the Nord Piano Library download area. Each and every one of these pianos can be replaced if you wish. There are plenty more to choose from in the Library area, including some XL versions of our grand pianos, with even more details like added velocity layers and pedal-down samples. And all those sounds are available for free. Not only loaded with great piano sounds, the Electro 3 also sports some great samples to add flavor to your sonic arsenal. You'll find some of the classic Mellotron sounds, a selection of strings, a celeste, a vibraphone and many others. And just as with the piano partition, all of the samples can be replaced if the factory selection does not suit your immediate needs. You can add virtually any sound you want to the Nord Electro 3. Sounds that we offer for free are from the Mellotron Library or any other instrument from the expanding and extensive Nord Sample Library, which is the same format as the Nord Wave uses. The growling sound, and the soul of a B3 is hard to replicate faithfully in a digital instrument. We've spent years perfecting our digital models and the Electro 3 contains the best emulation so far. The attention to minute details is stunning, the Electro 3 is even equipped with four selectable tonewheel modes, that stretches from a clean sound to battered unit with the most dramatic setting; vintage 3. This setting even produces a sound in the background of its own, even if you don't touch any keys. Every function in a B3 has been considered and examined in great detail, to make the Electro 3 as true to the original sound as possible. There are key clicks derived from the original busbar behavior and the energy robbing that produces the gentle compression when you do that massive palm smear across the keyboard. To get the response right, we have included the option to trigger the organ sounds at the very top of a key's range, making it react just as fast as the original. And sometimes we couldn't resist adding functions that went a bit further, like the option to either include or exclude the 9th drawbar when Percussion was activated. The Farfisa* and Vox* models are just as impressive as the B3. The massive savage sound created by their 12-top oscillator frequency-divider designs is of course also a nosample zone in the Electro 3; you have the same behavior and unique response from our models as in the original instruments. The Farfisa Compact Deluxe, considered by many to be the mother of transistor organs, involves routing matrixes and complex filter combinations that offer a tailored sound with massive energy and high-end. The Vox* Continental's brute design brings you a more hollow tone, but with a very intense character. Both these transistor organs have their own unique, irreplaceable personalities. Combine them with any of the Electro 3's speaker simulations, add some distortion, adjust the EQ and they will definitely get you through any organ gig with flying colors. Using the Organ Split mode, you can play two different organ registrations in a dual manual fashion, one sound on either side of a user definable keyboard split point. Connect a second MIDI keyboard to the Electro 3, to use the organ split functionality, but in a true, dual manual setup. The Nord Electro 3 is equipped with a great selection of high quality effects including a lush sounding reverb with five different algorithms. There is also a selection of tremolo, panning, wah-wah, phaser, flanger and chorus effects, and a ring modulator. User can further sculpt their final sound by choosing from a selection of three amplifier simulations that can add any amount of grit and distortion from gentle to manic levels. A three-band EQ with sweepable mid-range and a compressor can be added to the final stage of the audio path. The rotary speaker emulator originates from the award winning Nord C1 Combo Organ, with its acclaimed sound quality. This rotary speaker emulator incorporates the acoustic variations that occur when a physical speaker spreads the sound in a room, providing the full experience of when the air is moved around. The Electro 3's rotary also features a brand new function in the addition of the Rotary Stop Mode. This allows users to switch between fast and stopped rotation and back again by using either the controls on the panel or with a foot pedal connected to the Rotor Pedal input. This is a crucial functionality that mimics the behavior of early one-speed original rotary speaker units. Those of you who are picky about the rotary behaviors will be pleased to find several user adjustable settings like speed and acceleration times for both treble and bass rotors. These options, as well as all the other System, MIDI and Sound Menu functions are written on the right side of the panel, a great help for all those moments when the manual decided to stay at home.